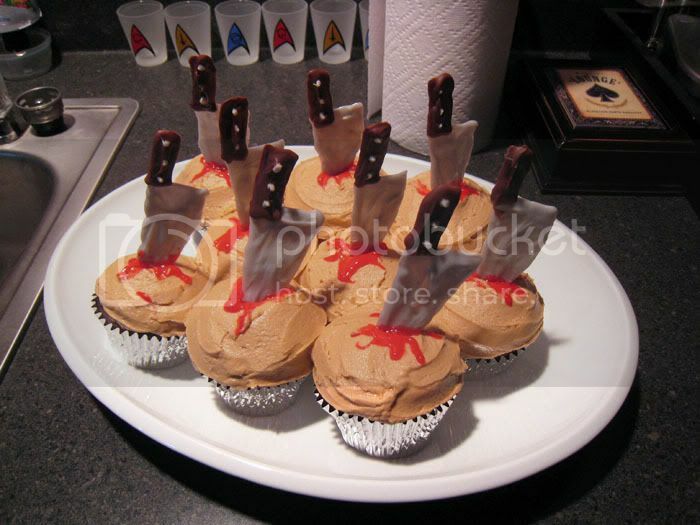 I made these cupcakes a few weeks ago for the season premiere of the TV show Dexter. It's an awesome show on Showtime! For those of you who don't know, it is about a serial killer you can't help but like. I made red velvet cupcakes (of course) to look like red flesh. Then I tinted plain butter cream frosting to look like skin. The knives are made out of melted and colored white chocolate I just piped onto some parchment paper in a knife-like shape and stuck in the fridge to harden. Once they were nice and solid I stabbed them into the fleshcakes and added a little of that horrible food decorators gel stuff to look like blood. Everyone really loved them and I might have to make them again for Halloween. these rock! how did you make the little knives? Love the cupcakes, also love Dexter too! Hope you enjoyed them, the knives are amazing. these would also be great for a divorce party. (cackles with glee....!) haha FABULOUS! doin it my self - cause it always turns out better! I put the melted chocolate in a pastry bag and just pipe a knife outline. Then fill it in with more chocolate. Then to the same with the handles making sure to overlap a little to it sticks together. It was really easy. The cupcakes look good, but I really wanted you to know that I am seriously coveting your Star Trek shot glasses!!!! !